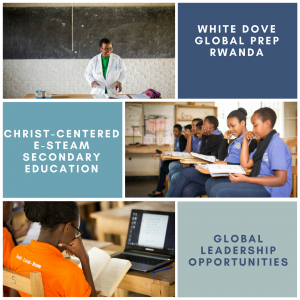 In only a matter of a few years, White Dove Global Prep Rwanda has become an internationally recognized secondary school for girls. The scholars at White Dove are excelling in academics, gaining leadership skills and making a name for themselves internationally. This small (but mighty) school offers native East African girls the foundation needed to start businesses, prepare for post-secondary success in the workforce and/or university and take hold of international leadership opportunities, all through a Christ-centered, e-STEAM curriculum. Quite simply, I am blown away! 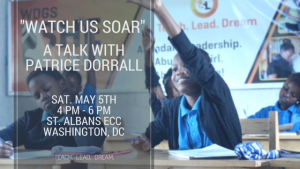 Join me on Saturday, May 5th for an evening with Patrice Dorrall, White Dove’s Head of School. She will be in Washington, DC for the weekend and will share more about the stories of triumph and success White Dove scholars are experiencing and the impact that the school is having not only on these scholars but their families and communities. A significant portion of the ticket sales will be donated to their fundraising efforts. Also, you have the opportunity to contribute at the event and online. Overview: Have you experienced a significant loss in your life? Are you willing to share your story, supporting your own healing and perhaps someone else's? This project sets out to explore the grief journeys of several individuals. The stories that real-life individuals share will inspire the characters in a novel under development. Woven together, it will tell a story of healing, resilience and celebration. The stories contained in the novel will be loosely based upon experiences that individuals share. If you are interested in being a part of this project please complete the questionnaire here. You will be contacted with specific details about your participation in this project. Hear me talk about my own experience with grief, resulting from the death of my mother. Overview: Fashion for the Cure is a powerful event that merges fashion and art to celebrate LIFE. Funds raised from each event are donated to local and national breast cancer initiatives to support research, treatment and awareness campaigns. Past beneficiaries include: Susan G. Komen Foundation, Capital Breast Care Center (CBCC) of Washington, DC and Healing with Basketball. Spring 2018: Be the first to hear about plans for the return of F4C. Sign up for the e-blast to be released soon.